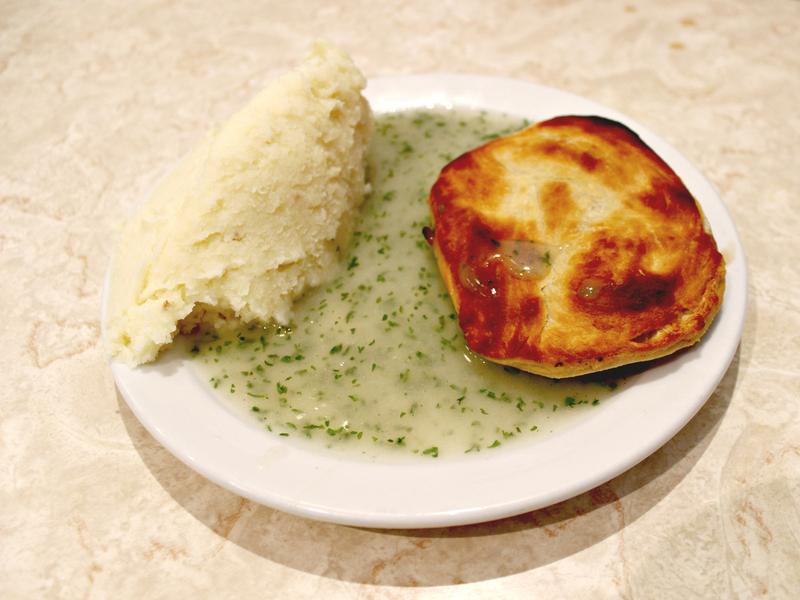 London’s traditional pie ’n’ mash shops are an endangered species. Usually small family-run businesses, some have been open for a century or more, and the survivors are hubs for local communities. If you’re into Instagramming your avo on toast, take note: along with roasts, fish ’n’ chips and full Englishes, this city was built on pies, gravy, eels and liquor. 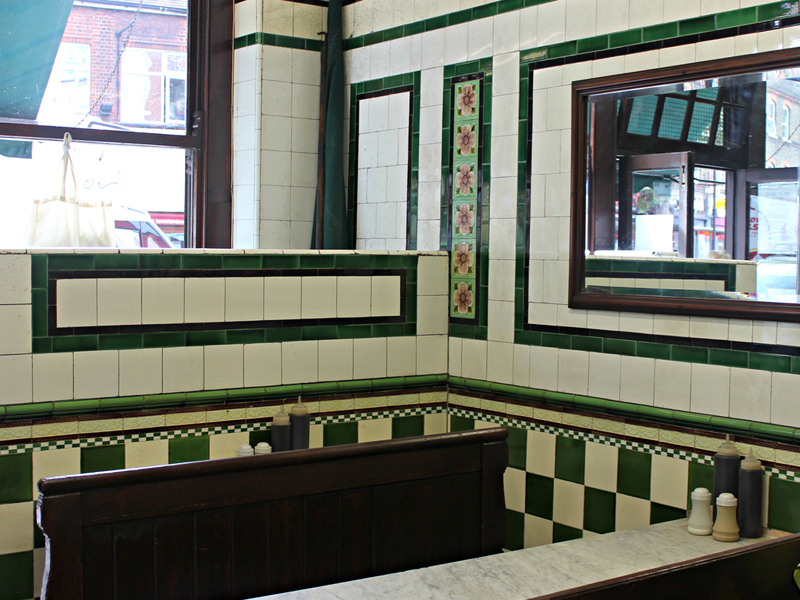 Compared to its shiny restaurant-style sibling in touristy Greenwich, Alfred Goddard’s original pie and mash shop is a pure-bred London classic. A fixture of Deptford High Street since 1890, its pies are still handmade using British beef and two kinds of pastry (suet for the base, flaky for the top). Our verdict? The mash and liquor are fine, the pie filling is everything you might expect and there are no gimmicks to be seen. Check out their gluten-free pies, too. 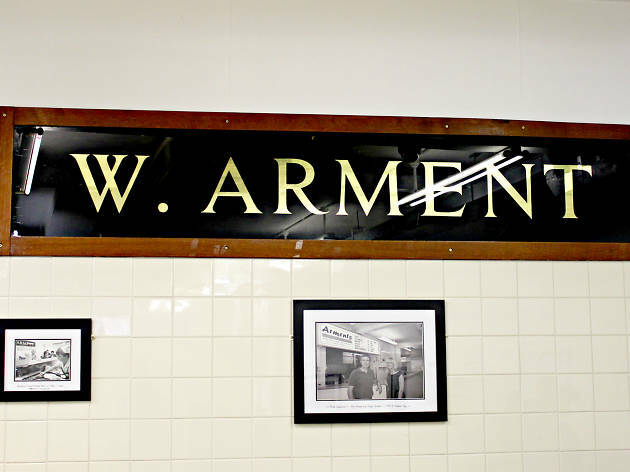 Just around the corner from Elephant and Castle, Arments has been operating since 1914 but is sadly let down by inconsistency. On a good day, the pies are remarkable with flaky pastry lids and a minced beef filling with plenty of gravy and no trace of gristle. At other times, however, the meat can be pallid, chewy and generally unappetising, making the smooth mash, generally brilliant liquor and signature chilli vinegar pale into insignificance. There are veggie and fruit pies too, however, and Arments are also known for their jellied eels. 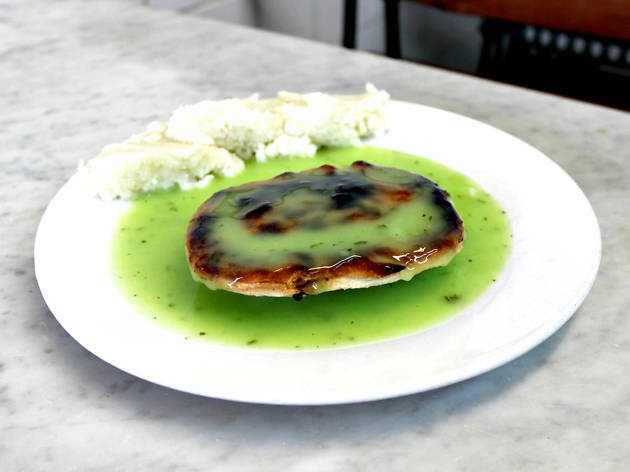 Towards the Canning Town end of Barking Road, BJ’s is one of the smaller pie and mash shops in the East End – but who cares about size. 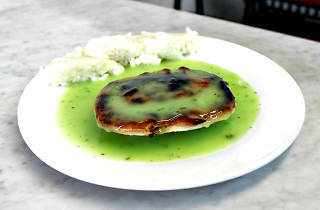 Served with some classic Cockney banter from a counter that’s peculiarly placed at the back of the premises, the pies are almost burnt (as is popular), filled with beef and rich gravy and served with well-seasoned liquor and creamy mash. BJ’s also dispenses some of the most reasonably priced stewed eels and – controversially – offers chips as an alternative to mash. 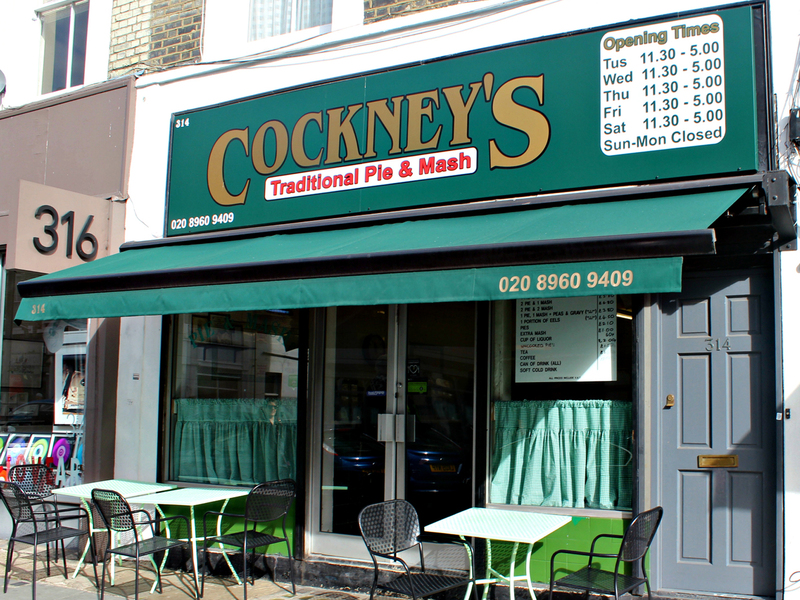 A rarity in west London, Cockney’s Pie & Mash sits at the north end of Portobello Road near Trellick Tower. Opened at the end of the twentieth century, it’s a relatively new kid on the block, yet the food is authentic: slopped into heavy white china bowls, the pies have a suet bottom and a buttery crust, while the bowl prevents the outrageous helping of thick liquor from spilling onto the table. It’s the perfect place to fill up before a leisurely stroll along Portobello’s renowned street market. Previously called ‘Traditional Pie & Mash’, this Chrisp Street Market site was taken over a few years ago but continues as one of the area’s key shops. The pies are filled with a satisfactory amount of gravy and the mince is fine, though the pastry can seem overly thick. Generous sized ice-cream scoops of mash are creamy, but the green parsley liquor can be bland – you’ll need to add copious lashings of vinegar and some serious seasoning. 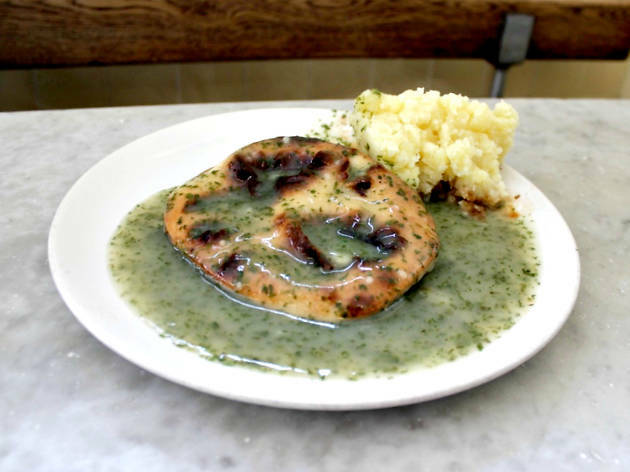 Veggie pies are also available, along with stewed and jellied eels. 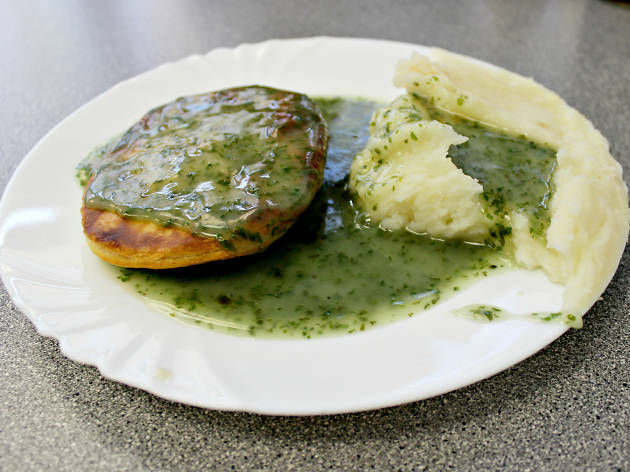 Offering exceptional value for money, the Noted Eel & Pie House in Leytonstone charges less than £3 for a reasonable helping of pie, mash and liquor served in a cheery setting complete with distinctive red benches. Their mash is incredibly smooth and, although small, the pies boast excellent thin pastry encasing a filling that needs no additional salt or seasoning. The liquor is tasty enough, although its texture is likely to coat the roof of your mouth until dinnertime. 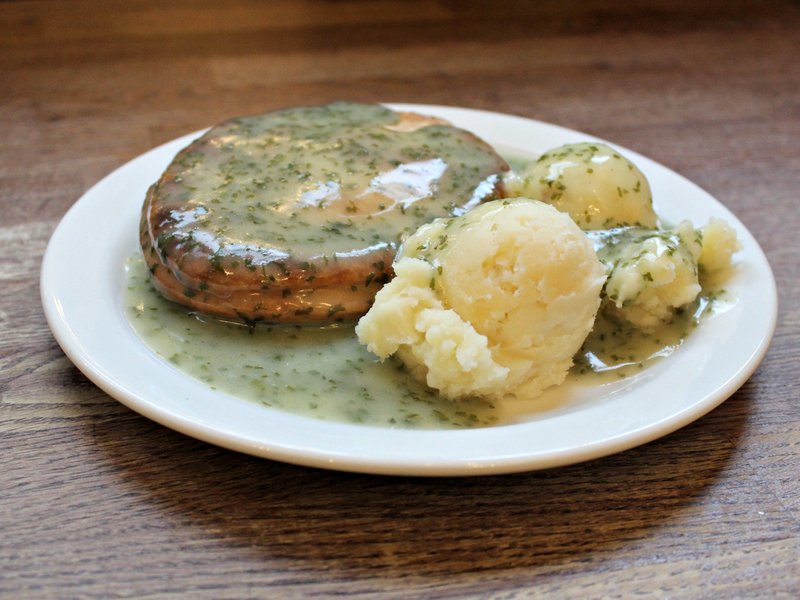 Owner Joe Cooke’s great-grandfather Robert opened his first premises near Brick Lane in 1862 (allegedly London’s first dedicated ‘pie and mash’ shop), and the family’s pies are still made to the original nineteenth-century recipe using the best-quality Scotch beef. The liquor has a pleasing consistency and depth of flavour like nowhere else, but the owners of this Hoxton institution refuse to serve gravy as a substitute – even with their made-to-order veggie pies. 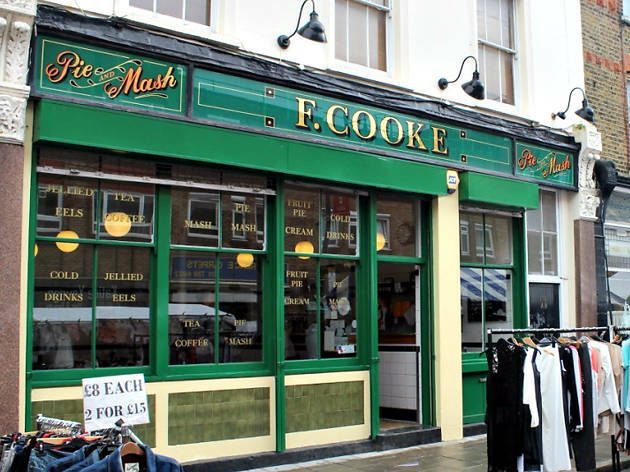 The oldest of the Cooke family’s surviving pie houses, this shop is famous for having sawdust sprinkled around its tables – a tradition that dates back to the time when discarded eel bones were chucked on the floor, making it slippery. 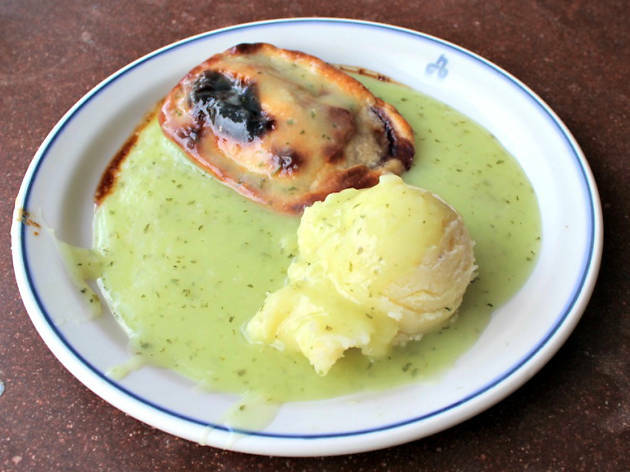 Trading since 1900, the shop is now run by the original owner’s great-grandson Robert, who sticks to the original recipe for some of East London’s best pies – well-browned and filled with beef and sweet gravy. Perfect with a steaming mug of rosy lee. 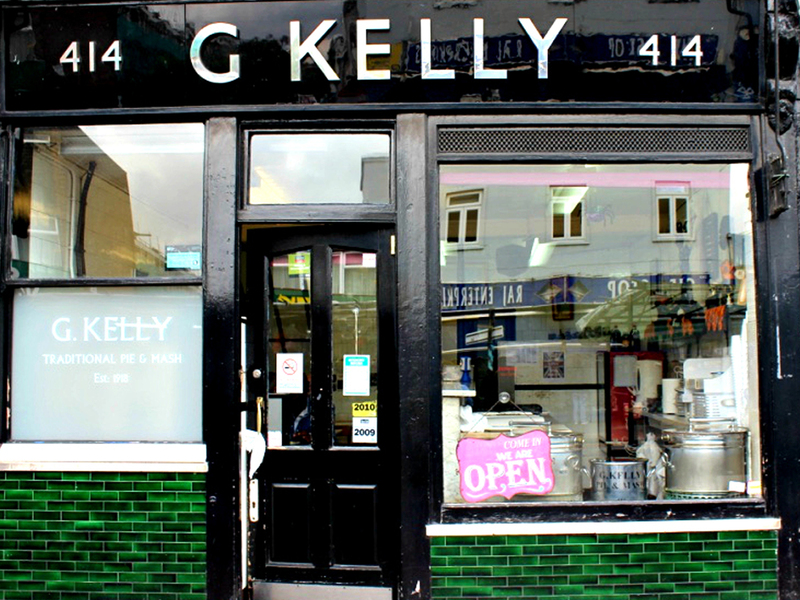 Despite the name, this shop at the station end of Bethnal Green Road is no longer connected to G Kelly on Roman Road Market – although both are in the business of purveying pies, mash and eels. Portraits of local boxing heroes adorn the white-tiled walls, the tabletops are marble, and the owners are known for putting up seasonal decorations come Easter or Christmas. As for the food, the pies are fine, though the coarse minced beef would benefit from a little more gravy. Sadly, the liquor is way too thick and often arrives cold on the plate. Although it was trading during the 1920s, this place really took off when a certain George Kelly arrived in 1939 and proceeded to put it on the eel and pie lover’s map. The shop began as fuelling point for the costermongers of Roman Road Market, although now attracts customers from far and wide – not surprising, given that the pies are filled to the brim with minced beef in a rich gravy and have a noticeably buttery pastry crust. If you need it, there’s fruit crumble and custard to finish. 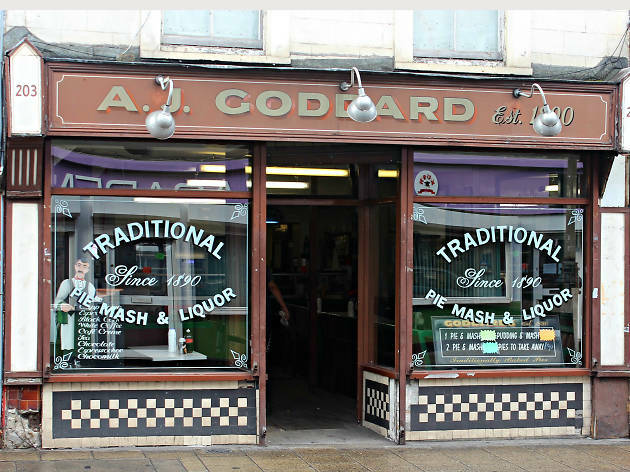 The sign on Goddard’s bottle-green frontage says ‘Est 1890’, although this shiny venue is merely the latest incarnation of a long-running family business. Food-wise, variety is the name of the game: there’s an impressive choice of pie fillings ranging from chicken and ham to lamb and rosemary, which are now overtaking minced beef in the popularity rankings. Goddard’s also sells gluten-free pies, along with calorie-laden handmade puds. Be warned: this place is regularly rammed with tourists on the Greenwich heritage trail. Venue says Gluten free pie, mash and liquor now available! Also known as Maureen’s ‘Cockney Food Bar’, this redoubtable pie and mash shop has been plying its trade on the pedestrianised part of Chrisp Street Market for more than 50 years. Inside, its looks more like a greasy spoon café with tiled walls, but the pies are some of the East End’s best. Smooth mashed potato is scraped onto the side of the plate and the dark liquor tastes almost minty. Maureen’s is also famed as a purveyor of hot salt beef sandwiches and beigels. 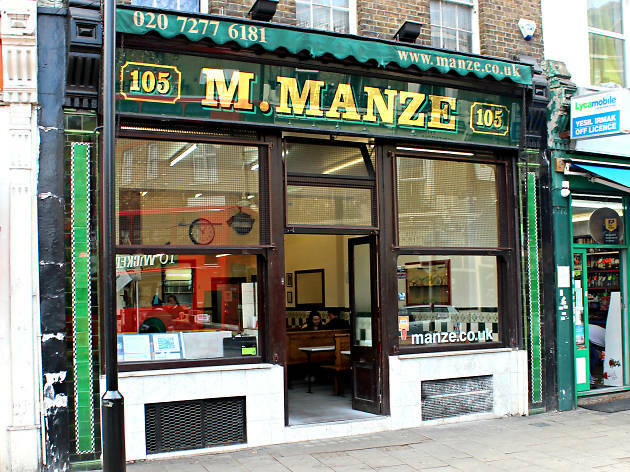 Michele Manze and family arrived from Italy in 1878, started out as ice-cream merchants and finally opened this pie, mash and eel shop in 1902. Inside, little seems to have changed since those early days: the Victorian green-tiled interiors speak of history, while the pie and mash is reckoned to be some of the best in town. The liquor can be a tad too thick, though the mash is smooth and the pie filling sits nicely between the soft suet-pastry base and the flaky, almost burnt lid. Originally opened in 1927, burned down during the Peckham riots in the 1985, then rebuilt and re-opened in 1990, this branch of Manze’s is run along similar lines to its elder brother on Tower Bridge Road. 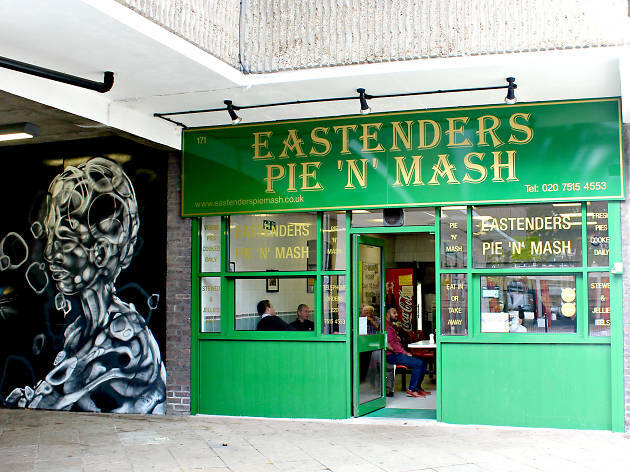 It serves up some of the best pies in town, with mash so smooth it tastes as if it’s been churned using an industrial mixer. The liquor’s also perfect – exactly the correct consistency and vivid green from fresh parsley (emphasised by the chilli-infused vinegar on the table). Undoubtedly south London’s finest for pie and mash. Ah, the greasy spoon. These traditional cafés are where formica tables, full English breakfasts and milky, milky tea rule supreme. These mostly family-run joints offer a welcome warmer than the toast and well faded 'celebrity' photos on the walls, and we love them for it. 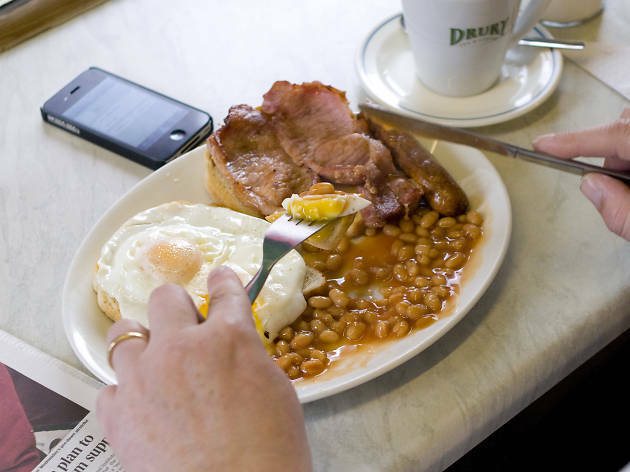 But, alas, they're a dying breed in London these days, so we've decided to celebrate the ten finest caffs in the capital. Long live the greasy spoon!